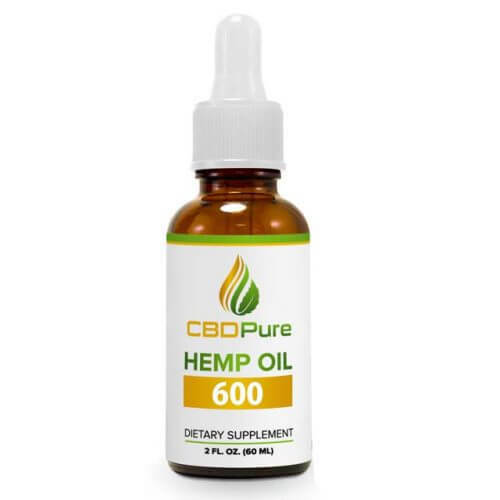 CBDPure is a company for those people looking to maximize their wellbeing, and the company have followed through with this mantra by producing their 600mg CBD Hemp Oil Extract. It is organically made, to ensure you get maximum relief and relaxation. This company works hard to deliver the best possible products infused with cannabidiol, which is extracted from some of the best naturally grown hemp plants in Colorado. Every product released by CBDPure has been tested and proven to be 100% safe and legal for consumption by its customers. They are very rich in terpenes, cannabidiol, and other cannabinoids. Most common medical conditions can be addressed in some way by cannabidiol. CBDPure uses the natural compounds found in hemp plants to offer people an alternative to harmful pharmaceuticals. Migraines: The high cannabidiol content in this product is very useful at making the product effective in dealing with chronic headaches. You don’t have to go for OTC drugs to deal with such a high magnitude of pain. Arthritis: It has been found to act very fast on joint pains, even the most severe. Using the 600mg CBD Hemp Oil Extract can really benefit painful arthritis joints. Inflammation: This may cause discomfort in your body and make you extremely restless. But CBD is well known for reducing painful areas of inflammation and this product is no different. Chronic pain: Whether you are suffering from severe back pains, joint pains or muscle pains. This CBDPure product can help you regain order in your body. Insomnia: If you are always awake at night and never get any sleep, or if you have very abnormal wake cycles, this 600mg Hemp Oil Extract can also cater for your sleep needs and send you into dreamland. Quality: The cannabinoids used in manufacturing this 600mg CBD hemp oil is usually obtained from naturally grown hemp plants. There are no added preservatives or toxic elements in this product, and there are no psychoactive elements in it – so it can’t get you high. Effects: CBD Hemp Oil Extract 600mg is well-known for being very effective in dealing with various pains and other medical conditions. It is 100% safe to use when you have conditions like migraines, arthritis, sleeplessness, depression, and chronic pain, among others. Price: You don’t have to drain your pocket to buy hemp oil; it costs just $79.99 to get the full results and relaxation of this product. Final Thoughts: Being at the peak of your health doesn’t have to be expensive, especially with this product. Jump on the bandwagon and experience CBD for yourself! Here at Hemp World Store we are dedicated to helping you find the best quality and most therapeutically effective CBD oils on the market. The current unregulated nature of the cannabis industry can make it extremely difficult to differentiate between the quality products and the “not so quality” products, but we’re here to help. We have years of experience in the cannabis news sector, and have essentially spent our careers keeping up to date with new products, new cannabis-related trends, and contemporary hemp-based research. Please feel free to contact us at any time with any cannabis or CBD-related questions you may have. We are NOT medical professionals, thus none of the information on this site should be taken as medical advice. Hemp World Store, 2019.